I have noticed that there are a few and highly popular websites with equipment reviews done by people who rarely use the equipment that they review. This is because most of us who use our cameras every day and for pay are too busy taking pictures to write about the gear. "Those who can do, those who can't teach." I've heard that tons of times, and I have spent my life trying to be the exception to the rule. I like to teach and I try to hold monthly classes and students often ask me if they need to have a lens like I do, or should they invest in this flash or that one. After a while I found myself answering the same good questions several times and I felt that maybe I could start to put this information up on the web for everyone (students, professionals, hobbyists, everyone) could get some use out of the information I have from years of taking pictures. In the cameras section you can read about several camera bodies, both film and digital, that may interest you. 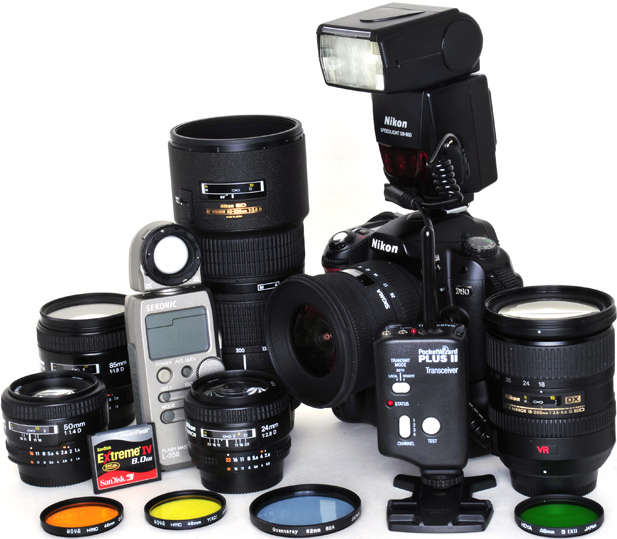 The largest area that I have written reviews so far is the lens section where I review many popular consumer as well as expensive professional lenses from several manufacturers. The Studio Lighting section is a new area where I am initially writing reviews of the equipment that I use in my studio, but I hope to add on soon to include lighting setup instructional parts so you can learn not just what equipment is good but how to use it, too. The section on software is a new section that needs a lot of work. I only have a single review there, but I hope to add more on not just the software that I use and why, but also how to use it to be most effective for you. Stay tuned for updates down the road here. A popular topic I get asked about is what are some good book recommendations and so I'm starting a page about them. I have a section of just "Other Gear" which includes the memory cards, the cleaning tools, and even things like the camera cases that we all end up buying to house, care for, and work with our camera gear. And finally I have a section of Articles on different photography topics including some instructional articles which may help you take better pictures. Keep checking back for more as I get time to write the reviews! I will only review equipment that I currently own, previously owned, or have had on loan for an extended period of time. Just holding something in the camera store or at a trade show is not even close to enough time to know the pros and cons of a product. I hereby promise to only review products that I know about. Currently, all of the reviews here are for products I or my associates have purchased with our own money. We receive no assistance from the equipment makers and receive nothing from them. We are not opposed to receiving equipment for review from them, but if it should happen we will be upfront about the origins of the product. Also, I want to be up front that I only use Nikon equipment. I have used Canon equipment and I judge it to be a fine product line, however for my needs and the types of things that I photograph, I have chosen Nikon. This site is not a Nikon vs. Canon fight. And finally, I link to product pages from online stores such as Adorama or Amazon. This is because I actually buy my equipment from these vendors and I do receive a small portion of sales generated by these links. This small income helps keep this site running, but I encourage you to shop around and find the best deals available to you.